Blank pages can be daunting. The still unwritten words of my story have only appeared in fleeting thoughts, wishes, hopes, imagined scenarios and maybes. Despite the uncertainties, a simple question helps to bring me focus and guide my purpose in life and career. I make small steps towards achieving that legacy every day. Rather than creating my future learning goals based upon a position or a job title, I start by reflecting on my sentence. To reach the expectations that I have set for myself, my future learning will have to be purposeful, challenging, and continuous. Change requires leadership, innovation requires creativity, and the ability to support others requires knowledge and collaboration. My future learning endeavors will embark on a mission to develop these qualities within myself and continue to do a little better each day. Creating positive change depends upon leaders who step up to challenge the status quo. As an introvert, a traditionally typical outspoken leadership style does not come naturally. However, I am confident in the many characteristics and skills I do possess that make me an even stronger leader than the classic extrovert. With that in mind, I would like to focus my future learning on strategies for culture building and communication as well as leveraging my skills with others to create an effective leadership team. Being new to a leadership position, I have several opportunities within my organization for future learning. I hope to participate in an Aspiring Principals Leadership Academy as the focus is building the skills necessary to be a strong leader. I plan to continue to speak, present and organize at educational events and hope to have the opportunity to present at conferences like the Michigan Association of Computer Users in Learning conference in the years to come. I also fully intend to continue to fuel my creativity, innovation and curiosity through playful exploration beyond the realm of education and educational technology. Without imagining new ways of doing things, experiencing new perspectives and places, and continually venturing outside of our comfort zone, we can become complacent and caught up in the daily grind. To combat this, I have a personal goal of traveling, specifically to Europe, and having studied abroad before I know that it will be a fantastic learning experience in itself. I have also considered attending the MAET Refresher Course Overseas as a part of that travel. I will continue to challenge myself to take on do-it-yourself projects and participate in the Maker Movement as I indulge the invigorating feeling I get when I engage in the creative process. I have taken courses at MakerWorks, a Makerspace, and plan to continue to build my skills in things like laser printing, 3D printing, embroidery, sewing and woodworking. In pursuing new and unique endeavors, I continue to develop passions that enrich both my life and career. In order to best support and collaborate for positive change with those that I work with, it will be necessary for me to keep up with the most current educational and technological knowledge. Staying informed will help me to make sound decisions when faced with challenges and will equip me with the tools that I need to work with educators, students, community and leaders. There are many ways that I plan to stay connected in the future. The first vital connection is Twitter. The extensive amount of up to date resources and connections available on the platform is staggering. As a learner, I plan to participate in more Twitter chats like #MichEd so that I continue to share, connect and collaborate on social media as much as I consume. The next key connection is continuing to develop my personal learning network. I want to continue to reach out to other educators, leaders and students to collaborate on solving small everyday struggles as well as solving larger systemic educational injustices. As I transition from student to graduate in the MAET program, I remember that I pen the words of my own story by the choices that I will make. 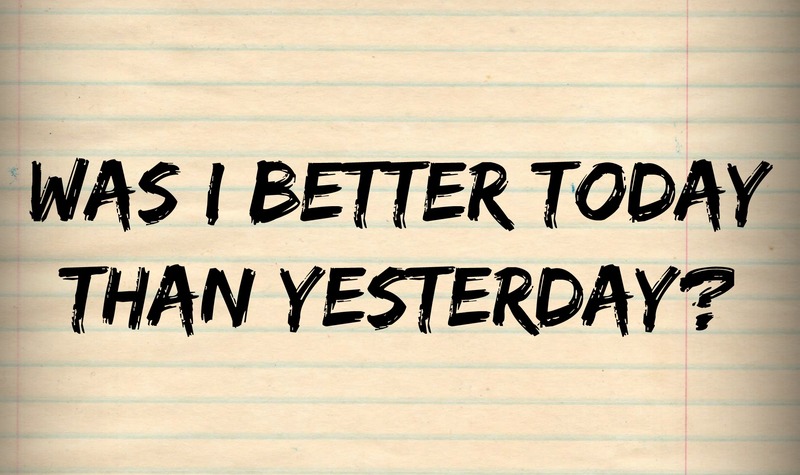 With the simple question of “Was I better today than yesterday?” as a guiding prompt, I know that I will be deliberate in those choices for future learning so that I can inspire, innovate, support and lead.